Ok, so those darn Torendi girls had to torment me with this YUMMY picture. I mean, seriously?? Who could resist this? I'm from California and we eat a lot of sushi here. 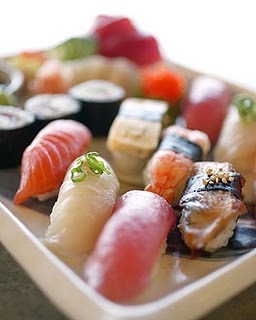 :) Now, I'm craving sushi like no one's business. I'll have to see if some of my girls will go out with me since Dustin does not partake in the sushi. Ok, so I took my inspiration from the yummy picture. I am out of sushi rub-ons and I'm kind of not sure what some of my other rub-ons are from THIS set. Teehee! But I do know that I can't eat sushi without some soy sauce. I mean, I can eat some rolls without it but just plain sashimi and maki rolls, I need soy sauce for. I colored my little soy sauce bottle with Copics, but I flat colored. :( I was tired, what can I say? The paper is Basic Grey. The ribbon is from May Arts. The punch I used is from Fiskars. 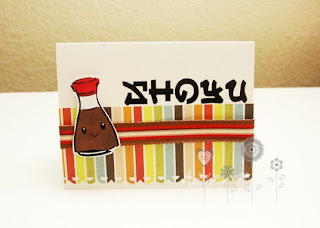 The image and sentiment (shoyu means soy sauce in Japanese) come from the Deliciously Kawaii rub-on set by EAD Designs for Torendi. Love you take on this challenge. This is just so adorable.